In Tripoli, official portraits of Muammar Gaddafi are everywhere: on giant murals and billboards, in hotel lobbies, offices, shops, homes, and schools. The “Brotherly Leader and Guide of the Revolution” usually appears as a sort of deity or in military uniform with rays of light shining behind him. Throughout Gaddafi’s reign, his obsessive control of how and where his image appears has been straight out of the dictator’s textbook. In Benghazi, a day’s drive east along the Mediterranean coast, there are also lots of public pictures of the man who has ruled this desert country for more than four decades. But here, his image is used as a weapon against him. Caricatures of the vilified leader and anti-regime or pro-democracy graffiti are popping up throughout the city centre and in recently trashed army bases, on building sites and on any suitable walls. 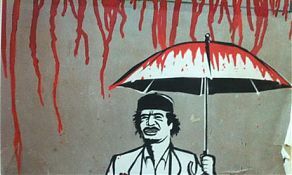 There are posters of Gaddafi pumping petrol into a winged camel, Gaddafi with the tail of a snake and a forked tongue, Gaddafi as Dracula, Gaddafi as a clown, Gaddafi being bitten by a dog, Gaddafi getting a boot in the head. The variations are countless. Another popular theme is an often bloodstained Gaddafi terrorising or slaughtering his people or plundering the oil-rich nation’s wealth. Tobruk, al-Bayda, Derna and other towns in the rebel-held east have also joined in this artistic act of rebellion, and their walls also sport caricatures ridiculing the flamboyant strongman whose many eccentricities make him a perfect target for satire. But Benghazi is the centre of the movement. Agence France-Presse sent me to Libya in late April to replace a correspondent in Misrata, a coastal town which has been bitterly fought over. However, in the end, the agency decided to keep me in Benghazi. From the moment I arrived, the city was buzzing. It was nearly three months since the anti-Gaddafi uprising had started there and the revolutionary fire burned brighter than ever. Gaddafi was still in power in Tripoli, his forces still controlling most of the country, but the frontline was, and still is, far from Benghazi, and the rebels are using the time to take stock, train their fighters and build for the future. “We have a dream,” is the slogan – written in English – on giant billboards that have started to appear across the city. Benghazi’s seafront is where that dream is most evident. The red, green and black flag of the uprising is everywhere, alongside French, British and US flags, a sign of gratitude for the Nato air strikes keeping Gaddafi’s forces at bay. Frenzied anti-Gaddafi rallies are held on most days in the seafront square, with tribal leaders, politicians or rebel fighters making fiery speeches, sparking wild applause and much celebratory gunfire. The revolution has lifted the lid on a repressed society and the people of Benghazi are making up for the lost years. They have quickly set up newspapers, radio stations and rap bands to say things that just a few months earlier would have got them locked up or worse. 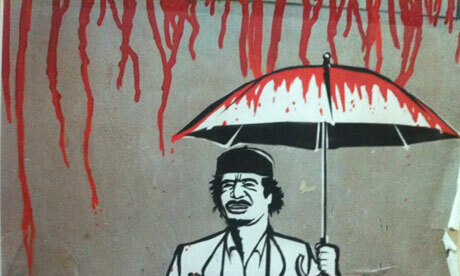 But the Gaddafi caricatures are the most striking manifestation of the new-found freedom of expression. They weren’t the first thing that caught my eye when I arrived at the courthouse. What did were the hundreds of posters bearing the photos and the names of those killed or missing since the uprising began. But inside, and on the walls of most nearby buildings, the mocking pictures dominate. I started taking photos of the drawings with my iPhone, at first just to show my friends and family back at home. But it became a little obsessive when I decided it was my duty to catalogue these works of art that might not last. The heady atmosphere in Benghazi made me speculate that this was what it might have been like in Havana at the start of the revolution, and the revolutionary art reminds me of the murals of Che Guevara and other rebel motifs that still adorn walls in Cuba. Nobody could tell me who was responsible for the wall paintings around the city, but I did find a group of young men who were churning out paper drawings of the detested dictator. They told me they had reached not for their guns but for their coloured pens and spray cans when Libya’s revolution started in mid-February. One of them had paid for it with his life, gunned down by secret police. The group now goes by the name of their dead colleague, Qais al-Halali, and continues its work from a ramshackle office in a makeshift “media centre” next to the court. When the uprising began, al-Halali and his friends started drawing caricatures on paper and distributing them around the city for people to show at demonstrations or hang on walls, one of the group, Akram al-Bruki, said.